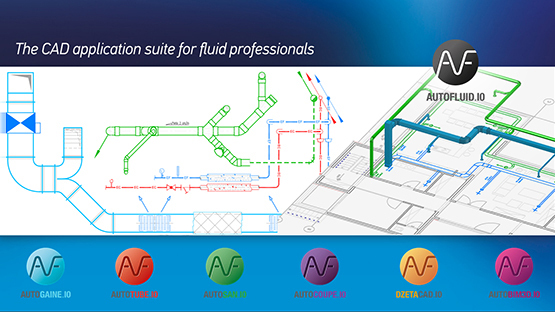 AUTOFLUID is the 2D-3D CAD package of choice for professionals in the fields of HVAC, sanitary, medical and industrial fluids. AUTOFLUID is widely adopted throughout the profession. From international firms to independent offices, our users have made us the leader in France. The suite is composed of six applications that were created by users and for users to save you precious time. We’re experts in the field of engineering for fluids and we’re doing our best to develop the simplest and the most pragmatic tools. AUTOFLUID brings together the performance of 2D network design and the benefits of collaborative BIM projects. In just a few steps AUTOBIM3D Xport transforms networks that were created in 2D, into 3D, ready to embed into models. Your 3D files are saved in .IFC format which is compatible with all common BIM packages on the market. Thanks to this format, the data associated with the objects contained into your drawings is encapsulated into the file itself, so they can be edited and shared directly into your modelling package. 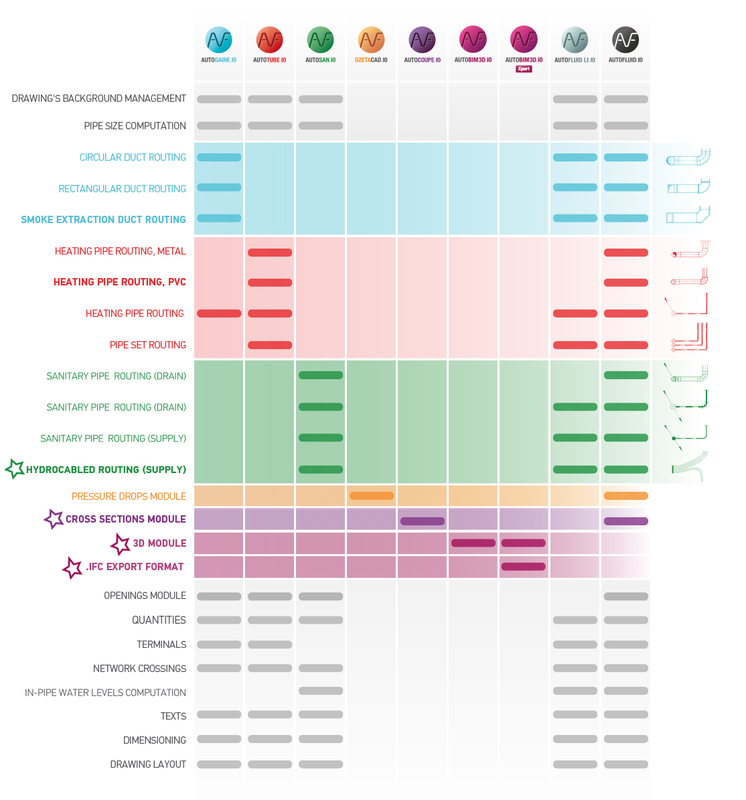 As a result you can collaborate on BIM projects with the same precision, the same skills and the same speed as in 2D. Beginner and expert training is available for each software. The AUTOFLUID 10 pack is composed of the 5 software of the suite. It includes all the necessary tools to create any type of HVAC engineering drawings. The AUTOFLUID Lt 10 package is a combination of AUTOGAINE and of the single line drawing tools of AUTOTUBE and AUTOSAN. AUTOGAINE 10 computes and draws in single line and in double line modes with precision. The application handles circular and rectangular ducts, vents and accessories implemented in ventilation and air-conditioning installations. AUTOTUBE 10 computes and draws pipe networks and tap fittings in single line and double line modes. The application handles parts at real scale according to the accuracy class, to the PN and to the type of material. AUTOSAN 10 lets you compute water supply networks and draw complete supply and drain pipework in single line and double line modes. The application also handles bills of materials. AUTOCOUPE 10 is specialised in creating cross sections generated from 2D plans, for the purpose of synthesis and spatial analysis. DZETACAD 10 lets you compute pressure drops directly from AUTOCAD, BricsCAD or ZWCAD with minimal effort. It handles air and fluids networks designed with AUTOGAINE or AUTOTUBE. Generate 3D networks from 2D drawings created with AUTOFLUID. The 3D files which are saved in .IFC format, are editable with all common 3D modelling software and compatible with all BIM projects.